Beer and grilled meat always go well together, but beer and meat for grilling - well, it is really something special. For all barbecuing and grilling lovers we have prepared this special marinade which make meat incredibly juicy, without added flavour enhancers - because all the ingredients are naturally powerful! Except marinading the meat for grilling, be daring and experiment with goulashes, paprikashes or stews. The power of beer taste is in your hands! 1. Shake well before opening! 2. Pour the marinade over meat or fish. 3. Marinate for 30 minutes or longer – to get a stronger taste. 4. 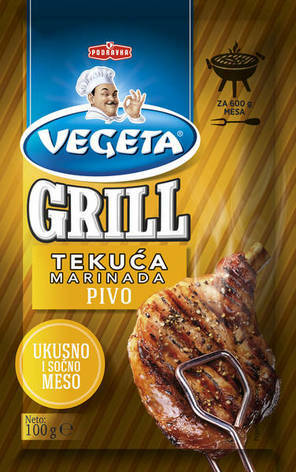 Roast on a barbeque, in a pan or in the oven. Water, vinegar, sugar, table salt, light lager 7% (water, barley malt, corn grits, hops, antioxidant (potassium metabisulfite), color (plain caramel)), sunflower oil, soy sauce (water, soybeans, wheat, table salt), modified corn starch, ginger, dried garlic, dried celery, black pepper, coriander, preservatives (potassium sorbate, sodium benzoate), antioxidant (rosemary extract). Storage: Keep in dry place at room temperature.